Even before you enter the gates of Baltimore’s Fort McHenry these days, it’s obvious that there is heavy construction activity going on in and around this popular national monument and historic shrine. As I write this, part of the entrance is blocked for a new sidewalk and curb installation and, just inside the gate, you are directed off to the right to a temporary parking lot. The old parking lot and the public restrooms have been removed and the site is being prepared for the construction of a new Visitor and Education Center, scheduled to open in the fall of 2011. 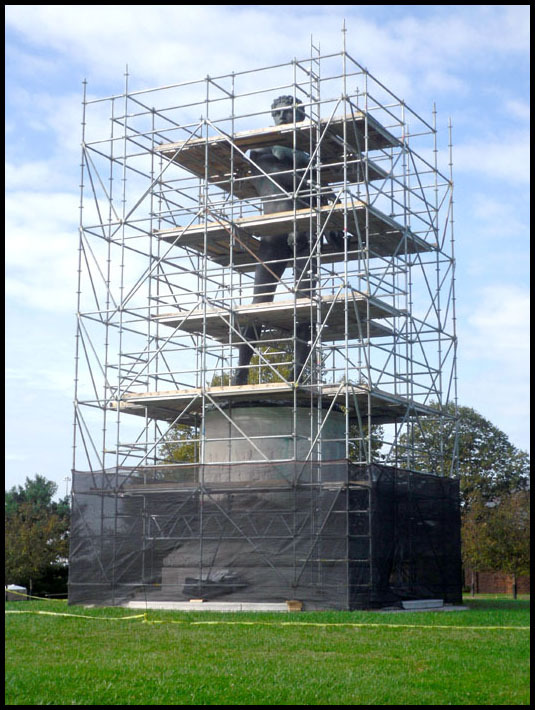 Meanwhile, the statue of Orpheus, an important figure from Greek mythology, revered for his association with poetry and music, and in this case dedicated to Francis Scott Key, composer of the Star Spangled Banner, was swathed for a time in scaffolding. Both Orpheus and the statue of Lieutenant Colonel George Armistead, commander of the fort during the British Navel bombardment in 1814, were cleaned and treated with a custom wax coating to seal and protect their natural green patina. 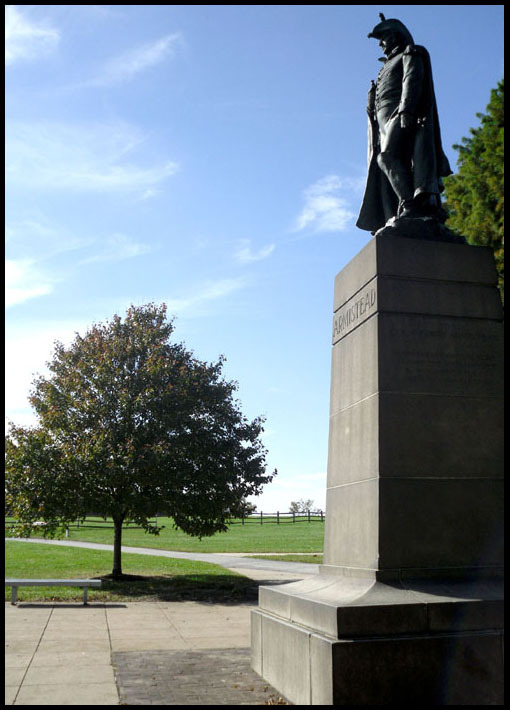 The same wax treatment was applied to the Francis Scott Key Plaque near the sally port entrance to the fort itself. These chores have been completed. The statues and plaque are looking sharp and await the completion and re-dedication of the new and expanded visitor facilities. Who knows, perhaps that clear blue sky in the “AFTER” image of Orpheus is an omen from the gods, foretelling a happy on-time and under-budget ending for the entire project. This entry was posted on Tuesday, November 10th, 2009 at 1:00 am and is filed under art, holidays, photography, poetry, travel, vacation. You can follow any responses to this entry through the RSS 2.0 feed. You can leave a response, or trackback from your own site. Nice write up. Wish we could visit with you on the waters edge and get caught up. We haven’t found our Ft McHenry out here yet. Nice hearing from you, Richard. I miss seeing you two on my walks. Since you’ve gone I haven’t found anyone with whom I can recreate our “mime-chats-in-motion” technique. Hope you’re thriving (and sleeping well) in Seattle. 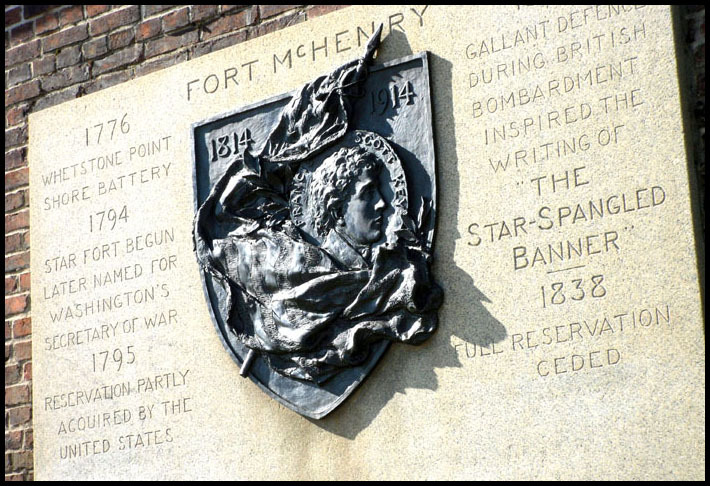 I absolutely love the photos of the “new” Fort McHenry… the old place certainly has changed a lot since I saw it last. It does my heart good. The photos of the graffiti, in the previous post, however… just makes me sad. Thank you for the comment, Jacquie. Interesting how different people feel about the graffitti post, though few (only one, actually — you) have taken the time to express it as a direct comment. I really appreciate that you did, and I’m curious to know if any one else felt something other than sadness. As for me, when I spotted the graffiti, which I thought was overwhelmed by the beautiful natural context, I just found them funny.